Almost every electronic hobbyist must have faced a scenario where he or she must measure the frequency of signal generated by a clock or a counter or a timer. We can use oscilloscope to do the job, but not all of us can afford an oscilloscope. We can buy equipment for measuring the frequency but all these devices are costly and are not for everyone. With that in mind we are going to design a simple yet efficient Frequency Counter using Arduino Uno and Schmitt trigger gate. This Frequency Counter is cost effective and can be easily made, we are going to use ARDUINO UNO for the measuring the frequency of signal, UNO is the heart of project here. To test the Frequency Meter, we are going to make a dummy signal generator. This dummy signal generator will be made by using a 555 timer chip. The timer circuit generates a square wave which will be provided to UNO for testing. With everything in place we will have a Frequency meter and a square wave generator. 555 timer IC and 74LS14 Schmitt trigger gate or NOT gate. The circuit diagram of the Frequency Meter using Arduino is shown in below figure. Circuit is simple, a LCD is interfaced with Arduino to display the measured frequency of signal. ‘Wave Input’ is going to Signal Generator Circuit, from which we are feeding signal to Arduino. A Schmitt trigger gate (IC 74LS14) is used to ensure that only rectangular wave is fed to Arduino. For filtering the noise we have added couple of capacitors across power. This Frequency Meter can measure frequencies up to 1 MHz. Signal generator circuit and Schmitt trigger have been explained below. Typical circuit of 555 in Astable mode is given below, from which we have derived the above given Signal Generator Circuit. Frequency (F) = 1/ (Time period) = 1.44/ ((RA+RB*2)*C). Here RA and RB are resistance values and C is capacitance value. By putting the resistance and capacitance values in above equation we get the frequency of output square wave. One can see that RB of above diagram is replaced by a pot in the Signal Generator Circuit; this is done so that we can get variable frequency square wave at the output for better testing. For simplicity, one can replace the pot with a simple resistor. We know that all the testing signals are not square or rectangular waves. We have triangular waves, tooth waves, sine waves and so on. With the UNO being able to detect only the square or rectangular waves, we need a device which could alter any signals to rectangular waves, thus we use Schmitt Trigger Gate. Schmitt trigger gate is a digital logic gate, designed for arithmetic and logical operations. We are going to use 74LS14 chip, this chip has 6 Schmitt Trigger gates in it. These SIX gates are connected internally as shown in below figure. The Truth Table of Inverted Schmitt Trigger gate is show in below figure, with this we have to program the UNO for inverting the positive and negative time periods at its terminals. Now we will feed any type of signal to ST gate, we will have rectangular wave of inverted time periods at the output, we will feed this signal to UNO. The given function measures the time for which High or Low level is present at PIN8 of Uno. So in a single cycle of wave, we will have the duration for the positive and negative levels in Micro seconds. The pulseIn function measures the time in micro seconds. In a given signal, we have high time = 10mS and low time = 30ms (with frequency 25 HZ). So 30000 will be stored in Ltime integer and 10000 in Htime. When we add them together we will have the Cycle Duration, and by inverting it we will have the Frequency. I like only Audio amplifier. so maked to Aurduino measurement. Hz, Amp, Mili Amp, Wattes, Etc. this project is simple to make and vry interesting. can i use this circuit as an oscilloscope?and where to modify?? No you cannot, The frequency counter cannot measure frequencies higher than 6Mhz. So it cannot detect radio signals. compensate if your Arduino crystal is off frequency by a small amount. 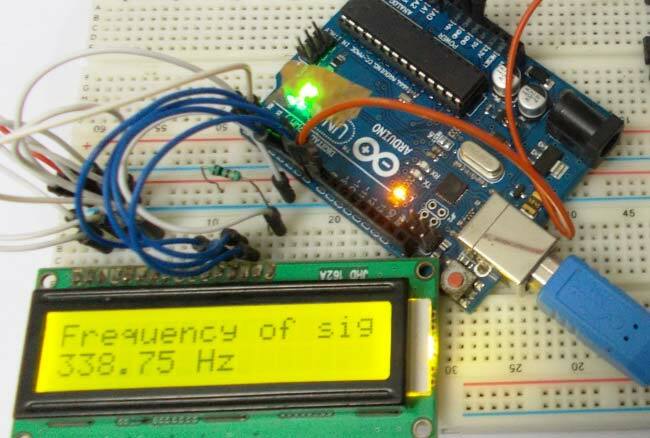 Yes you can use this idea to make an Arduino based frequency meter but for the higher frequencies encountered on HF bands you will need to add a pre-scaler. That will bring the HF signals down to where they can be measured by the pulse-width functions in Arduino libraries. A better way might be to use something like a 74HC4060 as a pre-scaler and make your Arduino software interrupt-driven so it toggles at LOW-->HIGH transitions of the pre-scaled signal. Then use the micro-seconds() counter to determine time between subsequent LOW-->HIGH transitions and calculate the frequency. Since some Arduino boards use a ceramic resonator for the 16 MHz oscillator you may see some temperature induced drift. Frequency correction can be done in software but this does not stop the drift. There are some Arduinio Pro-mini boards available from Ebay vendors that use a real crystal for the 16 MHz oscillator. These are much better for Arduino-based frequency counters. I built this circuit as per your instructions & tested it against my O-scope. I get a non-lin addative drift of about 15hz per 100 ie. : 100hz= 114.7 to 15ish (arduino output floats) , 200hz= 230ish etc from my frequecy generator. My O-scope verifies that the generator is right on the money. Is this an inherant accuracy expectancy or could something else be at play here? How accurate where your readings? Any ideas or input greatly appreciated. been fixed and operation speed has been improved (slightly). inputs, which provides a pseudo auto-ranging operation. factors may noticeably slow counting of VLF and audio signals. lcd.print(" Hz"); // add suffix to show measurement is in Hz. Would this work with a frequency range of 108-136 MhZ? I would like to add this to a Airband Receiver project. What would I have to change in order to get these frequencies displayed? "int prescale = 1; // change this if a pre-scaler is added"
Would you still recommend the 74HC4060 chip substitution? Great project ! I'm just starting with the Arduino and would like to put this project together. I'm in the USA and I can't find the LCD JHD_162ALCD referred to in the companion article (LCD is interfaced with Arduino ). Can anyone provide a source for the LCD or is there an alternative (please provide part nbr) ? Also, the sketch refers to the LiquidCrystal.h library: Being new to the Arduino is this part of the Arduino code base or do I need to dowload the library from some where? Any help is appreciated ! Thanks. You can buy any 16*2 Alphanumeric LCD module that is available in your local market. It should be easy for you to find one in you local hardware store. The LCD library for Arduino will be loaded by default in your Arduino IDE so you dont have to worry about it. Hi, I want to measure a phonic wheel sensor which submit between 0 hz to 1300 hz, I wonder if this method could shows accurate results for this range? This circuit can measure upto 1MHz of frequency but it is most suitable for measuring frequency of digitally generated Square wave. this simple code has helped me to simplify my ground capacitive moisture meter . I had all the pins in Arduino One engaged and I could not use the Frequencycounter library that requires the pin D5 free. Can i use 20*4 lcd display ? ?If possible ,how? why the hell the frequency is changing when we are changing 47k pot for same signal. For a particular signal it should show some frequency,for different signals it should show different frequency . Frequency counter means it should count the frequency of the given signal ,for example if we give our household power signal it should show approx 50 Hz. I am not able to understand the main idea behind signal generator(using 555 timer), when the input signal is fed to the arduino through schmitt trigger gate arduino will count number of pulses passing per second from which we get frequency then what is the use of dummy signal generator there ??? house hold AC can damage the circuit, and if you have square wave of known frequency you can provide input from that too. Here 555 is just to give demonstration of the protect. Can we use a simple NOT gate instead of your Schmidt Trigger NOT gate??? If not plz tell in short why. What's special with this 7414 gate? I have a better way don't use pulseIn() function because this is an indirect way and have many complicated process's , but count the number of transitions from HIGH to LOW (or LOW to HIGH) in a second that is frequency. Can you share with me your libraries? I have a problem regarding to the pulseIn() function. I am using an Arduino Micro for my work. The problem is that I get false results in PWM measurement. I used the Code shown on this page. My PWM Signal is simulated by the Arduino and has 2Hz. it would be nice if you guys could help me with that problem. I doubt problem is more with your hardware. Are you sure you are getting nice PWM at the input? Also what is the use of "digitalRead(PWM);"
I may be wrong, but aren't you trying to read pwm with the same arduino that generates it? When you want to detect a pulse it is not there because at the end of the loop you turned the signal low. H and L are 0, so dividing 1000000 by 0 gives you an error. This is fantastic. Good job. Thanks. Can you PLEASE post a diagram of how the 555 and SN54 are connected? I had it working last week and for the life of me I cannot get it working again! Better yet, post a diagram of the entire circuit. Whenever I run the sketch I only get ~60Hz, which is the powerline frequency. I had it working perfectly and then when I went to implement it into my lighted electric drum project it no longer worked. What's the use of 1000 uF capacitor? No1: may I use HEF40106BP (CMOS HEX SCHMITT TRIGGER) as a substitute of 74LS14? Do you mean the +5V DC power pin and Gnd pin of the Adruino board, or the Vcc pin of the Schmitt trigger IC? Olá alguem pode me ajudar a desenvolver um simulador de roda fonica com arduino que tenha display e ajuste de rotação?